Living in Las Vegas, locals can view high-end performances and art on the Strip while also having a variety of art and culture throughout the rest of the valley. The northwest area, specifically, offers galleries, theater and dance classes to satisfy one’s artistic needs. Art, after all, does more than provide a pretty picture. Living in Las Vegas, locals can view high-end performances and art on the Strip while also having a variety of art and culture throughout the rest of the valley. The northwest area, specifically, offers galleries, theater and dance classes to satisfy one’s artistic needs. Art, after all, does more than provide a pretty picture. 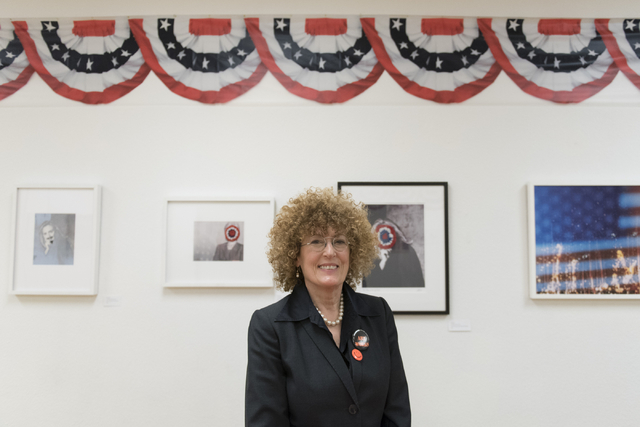 When Vicki Richardson opened the Left of Center Gallery, 2207 W. Gowan Road, she made it her priority to create a welcoming and nurturing space for minority artists. 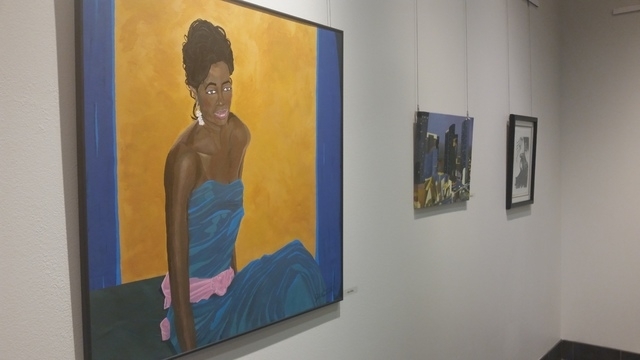 The nonprofit educational gallery features works by local and internationally known artists. Its focus is to educate the public through art, push community involvement and mentor and nurture emerging artists. 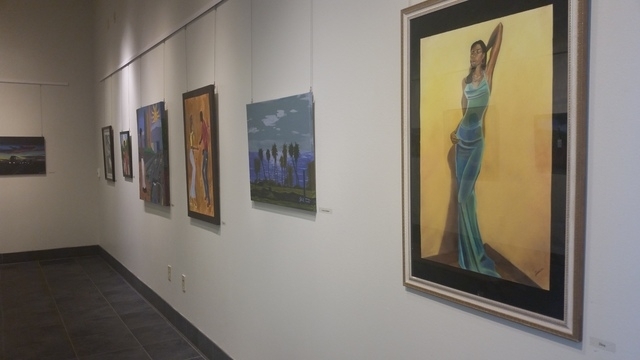 Its permanent exhibit, “The Rhythms of Africa” opened in the summer and features paintings by Calvin B. Jones, including a piece previously featured at the Smithsonian. African statues, masks, musical instruments, baskets, cloth and various other artifacts are also on display from the private collection of Joseph Walker, Richardson and her husband, Lou. The exhibit features displays from the Kuba, Baga, Senufo, Pende, Mbulu-Ngulu and other tribes. Some pieces come accompanied by stories of their origins and traditional usage. The gallery features a lounge downstairs for resident artists to work in the studio and network. Currently on display is “Mug Shots #3” by Diane Bush. 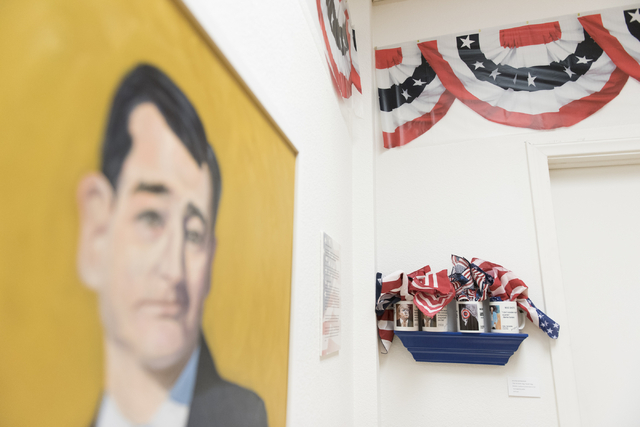 This third installation of “Mug Shots” is planned during regular gallery hours through March 31. “Mug Shots” is part of a yearlong series of mini-installations created and curated by multimedia artist and ex-educator Bush, who is set to provide the public with humorous and collectible artist-designed mugs, framed artwork and commemorative ceramic plates. For those itching to learn to make art, oil and acrylic painting classes are scheduled from noon to 2 p.m. Tuesdays and Thursdays for $20. Drawing classes are set from 10 a.m. to noon Saturdays for $20. 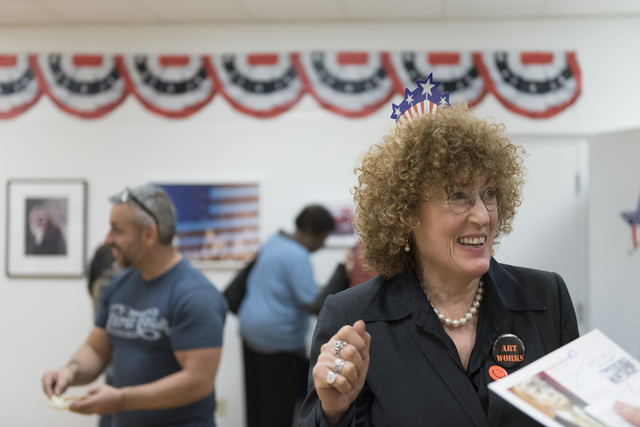 There is also an open house scheduled from 11 a.m. to 3 p.m. every Saturday for artists to network with one another and the community. The next exhibit, “North, East,” is planned April 19 through July 2. The gallery is set to feature a group of artists working with different mediums, who have either lived, worked or have a connection to northeast Las Vegas. One place to look at art is inside local libraries. At the Centennial Hills Library, 6711 N Buffalo Drive, a gallery is located near the back entrance. On display through May 10 is “A Joyful Perspective” by John Trimble. 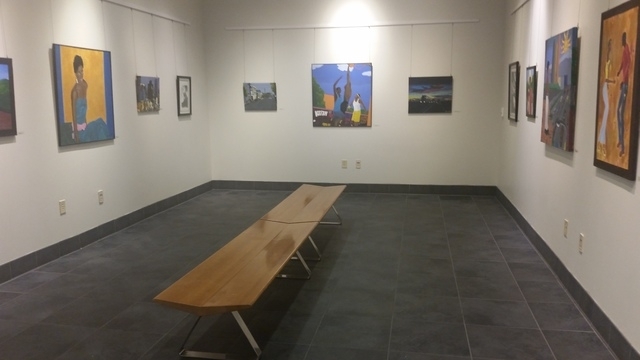 The exhibit features Trimble’s acrylic paintings and prints illustrating the various moods and emotions of daily life through the use of amplified color. They offer a multicultural perspective on American landscapes and culture. The Alexander Library, 1755 W. Alexander Road, has a small wall space along its main hallway. “We focus mainly on education and art displays from some of the nearby schools,” said Pam Zehnder, branch manager at the Alexander Library. Its current exhibit is the “Gallery of Clean Energy Inventions” by Gary Vesperman, set to run through June 22. The exhibit showcases generators, advanced self-powered electric vehicle innovations, radioactivity neutralization methods, space travel innovations, technical solutions to water shortages and a torsion field school network. It is also set to include Hubble Space Telescope images and a student contest. An alternative to the entertainment offered on the Strip is the Craig Ranch Regional Park Amphitheater, 628 W. Craig Road, which caters to locals. The amphitheater features a large pond and canopy covering half the stage and has three tiers, including one with concrete seating for chairs and two with grass. It plans to offer specially curated fare and libations for purchase from local food trucks and community concessionaires. Merchandise such as blankets, ball caps, glow sticks and flashlights are also set to be available for purchase. The spring and summertime offer a plethora of cultural activities, including summer concerts, movies, festivities and more. North Las Vegas offers more than just art galleries: Ballet classes are also within reach. The North Las Vegas Ballet Theater, 205 W. Centennial Parkway, No. 120, which opened last August, caters to novices and advanced performers alike. Its instructor Bernadette Sanders has been teaching dance professionally for more than 26 years. She was trained in classical ballet at Olympic Ballet Theatre and School in Edmonds, Wash.; the Duke Ellington School of the Arts and the Jones-Haywood School of Ballet, both in Washington, D.C.; the Maryland Youth Ballet in Silver Spring, Md. ; and in New York City at Steps on Broadway, the Broadway Dance Center and the Dance Theatre of Harlem’s pre-professional program. The school offers classes, including Dancing with Mommy, Dance Me A Story, creative movement, pre-ballet, ballet, jazz/hip-hop, modern dance, tap and character sessions. Visit nlvbt.com or call 702-965-2071. One doesn’t have to travel far to view an optimal theater performance. The Nicholas J. Horn Theater inside the College of Southern Nevada’s Cheyenne campus, 3200 E. Cheyenne Ave., offers musical, dance and theater performances. A CSN Student Dance Concert is scheduled April 1. Also nestled inside the CSN Cheyenne campus, 3200 E. Cheyenne Ave., are the CSN Fine Arts and Artspace galleries. Student artwork is exhibited at times throughout the year to highlight their success in the classroom. Fulmer said the school received more than 100 proposals last year for just 10 open slots, with proposals received from local, regional, national and international artists and arts organizations representing rich, culturally diverse applications from Austrian, Canadian, Chinese, Ethiopian, French, Iranian, Japanese, Mexican, Spanish, Swiss and Thai artists. “Art of the Young Child” is set to be on display April 1 through 28 at the Artspace Gallery, while Shelby Shadwell’s “COMEDIE” is planned from March 30 through May 28 at the Fine Arts Gallery. All CSN art gallery events are free and open to the public. 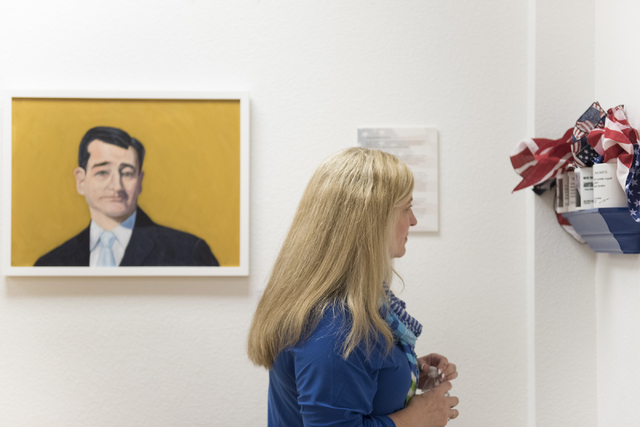 Fine Art Gallery hours are from 9 a.m. to 4 p.m. Monday through Friday and 10 a.m. to 2 p.m. Saturday. 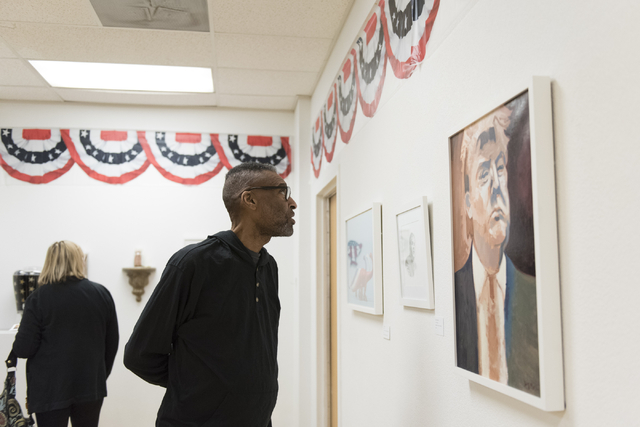 Artspace Gallery hours are from 8 a.m. to 10:30 p.m. Monday through Friday and 8 a.m. to 5 p.m. Saturday Both galleries are at the half circle drive near CSN’s main entrance, on the Cheyenne campus, 1 mile east of Interstate 15 North.